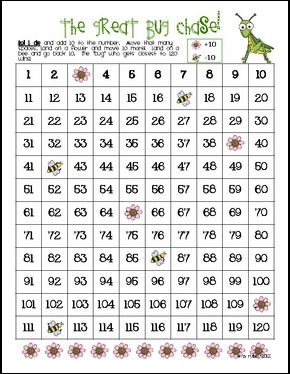 There are 2 "different" games----each with 2 versions using the 120 chart. Both use dice to "move" through the chart. The first one will use 1 die and the kids will add 10 to the number. A second version of this has "roadblocks" along the way for kids to go back or forward more. 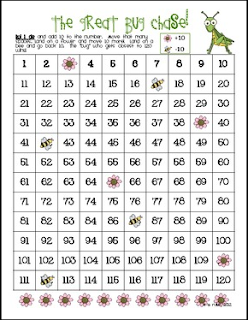 The second game uses 2 dice and students will add the numbers together. A second version to this has the same "roadblocks" as above. They go perfectly with my Catching Common Core Bugs Math games!